Powered pallet jacks, also known as electric pallet trucks, walkies, single or double pallet jacks, or power jack, are motorized to allow lifting and moving of heavier and stacked pallets. Rider Jacks contain a platform for the user to stand while moving pallets. 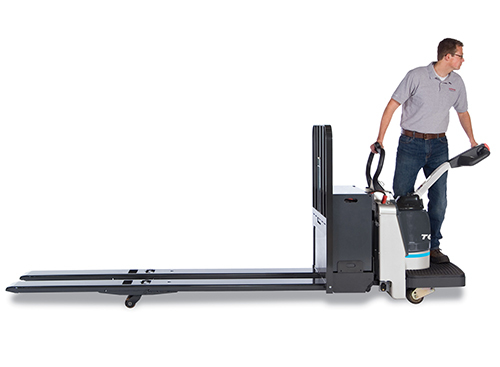 The powered pallet jack is generally moved by a throttle on the handle to move forward or in reverse and steered by swinging the handle in the intended direction. Rider jacks have a dead man switch coupled with a brake to stop the machine should the user need to stop quickly or leave the machine while it is in use. Most use a system known as "plugging" where the driver reverses the throttle to slow or stop the jack.